Atal Bihari Vajpayee (born 25 December 1924 in Gwalior) is an Indian statesman who served as the 10th Prime Minister of India, in two non-consecutive terms, first for 13 days in 1996 and then from 1998 to 2004. A parliamentarian for over four decades, Vajpayee was elected to the Lok Sabha (the lower house of India's Parliament) nine times, and twice to the Rajya Sabha (upper house). He also served as the Member of Parliament from Lucknow, Uttar Pradesh, until 2009, when he retired from active politics due to health concerns. Vajpayee was one amongst the founder members of the erstwhile Jana Sangh and had also been its president. He was also the Minister of External Affairs in the cabinet of Morarji Desai. When the Janata government collapsed, Vajpayee renamed his former party Jana Sangh as Bharatiya Janata Party (BJP). Atal Bihari Vajpayee was born to Krishna Devi and Krishna Bihari Vajpayee on 25 December 1924 in a middle-class Brahmin family. His grandfather, Pandit Shyam Lal Vajpayee, had migrated to Gwalior from his ancestral village of Bateshwar, Uttar Pradesh and his father, Krishna Bihari Vajpayee, was a poet and a schoolmaster in his hometown. Vajpayee did his schooling from the Saraswati Shishu Mandir, Gorkhi, Bara, Gwalior. Vajpayee attended Gwalior's Victoria College (now Laxmi Bai College) and graduated with distinction in Hindi, English and Sanskrit. He completed his post-graduation with an M.A. in Political Science from DAV College, Kanpur, in first-class. Later he became a full-time worker of the Hindu organisation Rashtriya Swayamsevak Sangh (RSS). For a while Vajpayee studied law, but midstream he chose to become a journalist. This choice was largely influenced by the fact that as a student he had been an activist in India's struggle for freedom. He edited Rashtradharma (a Hindi monthly), Panchjanya (a Hindi weekly) and the dailies Swadesh and Veer Arjun. Like other full-time workers of the Sangh, Vajpayee never married and remained a bachelor his entire life. Vajpayee's first tryst with politics was seen in August 1942, when he and his elder brother Prem were arrested for 23 days during the Quit India movement. In 1951, he was deputed to work for the newly formed Bharatiya Jana Sangh, a right-wing political party associated with the RSS that espoused the Hindu cause. He soon became a follower and aide of party leader Syama Prasad Mookerjee. In 1954, Vajpayee was with Mookerjee when he went on a fast-unto-death in Kashmir to protest against perceived inferior treatment of non-Kashmiri Indian visitors to the state. Mookerjee died in prison during this strike. In 1957, Vajpayee was elected to the Lok Sabha, the lower house of India's Parliament, where his oratorial skills so impressed Prime Minister Jawaharlal Nehru that he predicted that Vajpayee would someday become India's Prime Minister. By virtue of his oratorial and organizational skills, he became the face of the Jana Sangh. After the tragic death of Deendayal Upadhyaya, the mantle of the leadership of Jana Sangh fell on the shoulders of a young Vajpayee. He became the national president of the Jana Sangh in 1968 and, along with Nanaji Deshmukh, Balraj Madhok and Lal Krishna Advani, led the Jana Sangh to national prominence. Foreign Minister Vajpayee (far right) and Prime Minister Morarji Desai (third from right, front row) with US President Jimmy Carter during his 1978 visit to India. Vajpayee joined many of his Bharatiya Jana Sangh and Rashtriya Swayamsewak Sangh colleagues, particularly his long-time friends Lal Krishna Advani and Bhairon Singh Shekhawat, to found the Bharatiya Janata Party (BJP) in 1980. He became the BJP's first President. He emerged as a strong critic of the Congress (I) government that followed the Janata[disambiguation needed] government. While the BJP opposed the Sikh militancy that was rising in the state of Punjab, it also blamed Prime Minister Indira Gandhi for her divisive and corrupt politics that fostered such militancy at the expense of national unity and integrity. The BJP did not support Operation Blue Star and strongly protested against the violence towards Sikhs in Delhi that broke out in 1984 following the assassination of Indira Gandhi by two of her Sikh bodyguards. The BJP was left with only two parliamentary seats in the 1984 elections. During this period, Vajpayee remained at the centre-stage as party President and Leader of the Opposition in the Parliament. The BJP became the political voice of the Ram Janmabhoomi Mandir Movement, which was led by activists of the Vishwa Hindu Parishad (VHP) and the RSS, and which sought to build a temple dedicated to Lord Rama at the site of the Babri mosque in Ayodhya. Victory in the assembly elections in Gujarat and Maharashtra in March 1995, and a good performance in the elections to the Karnataka assembly in December 1994, propelled the BJP to greater political prominence. During a BJP conference in Mumbai in November 1995, BJP President L.K. Advani declared that Vajpayee would become the Prime Minister of India. The BJP won in the May 1996 parliamentary elections. 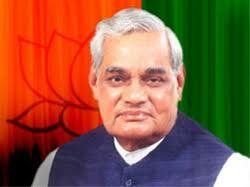 Vajpayee served as the Prime Minister of India from 1996 to 2004 in three non-consecutive terms. The BJP grew in strength in the early 1995s riding on pro nationalistic sentiments. In the 1996 general elections, the BJP emerged as the single largest party in the Lok Sabha. The then president Shankar Dayal Sharma invited Vajpayee to form the government in accordance with the Westminster custom. Vajpayee was sworn in as the 11th Prime Minister of India, but the BJP failed to muster enough support from other parties to obtain a majority. He resigned after 13 days, when it became clear that he could not garner a majority. After the fall of the two United Front governments between 1996 and 1998, Lok Sabha, the lower house of India's Parliament was dissolved and fresh elections were held. The 1998 general elections again put the BJP ahead of others. This time, a cohesive bloc of political parties joined the BJP to form the National Democratic Alliance (NDA), and A.B. Vajpayee was sworn in as the Prime Minister. The NDA proved its majority in the parliament. The government lasted 13 months until mid-1999 when the All India Anna Dravida Munnetra Kazhagam (AIADMK) under J. Jayalalitha withdrew its support to the government. The government lost the ensuing vote of confidence motion in the Lok Sabha by a single vote. As the Opposition was unable to come up with the numbers to form the new government, Lok Sabha, the lower house of India's Parliament was again dissolved and fresh elections were held. Vajpayee remaining the Prime Minister until the elections were held. In May 1998, India conducted five underground nuclear tests in Pokhran desert in Rajasthan. The tests were held just a month after the government had been in power. Two weeks later, Pakistan responded with its own nuclear tests making it the newest declared nation with nuclear weapons. While some nations, such as Russia and France, endorsed India's right to defensive nuclear power, others including the United States, Canada, Japan, Britain and the European Union imposed sanctions on information, resources and technology to India. In spite of the intense international criticism and the steady decline in foreign investment and trade, the nuclear tests were popular domestically. The Vajpayee-led government was faced with two crises in mid-1999. The All India Anna Dravida Munnetra Kazhagam (AIADMK) had continually threatened to withdraw from the coalition and national leaders repeatedly flew down from Delhi to Chennai to pacify the AIADMK chief J. Jayalalitha. However, in May 1999, the AIADMK did pull the plug on the NDA, and the Vajpayee administration was reduced to a caretaker status pending fresh elections scheduled for October 1999. It was revealed that militants and non-uniformed Pakistani soldiers (many with official identifications and Pakistan Army's custom weaponry) had infiltrated into the Kashmir Valley and captured control of border hilltops, unmanned border posts and were spreading out fast. The incursion was centred around the town of Kargil, but also included the Batalik and Akhnoor sectors and artillery exchanges at the Siachen Glacier. In the 1999 general elections, the BJP-led NDA won 303 seats out of the 543 seats in the Lok Sabha, in the aftermath of the Kargil operations,thereby securing a comfortable and stable majority. On 13 October 1999, Atal Bihari Vajpayee took oath as Prime Minister of India for the third time. A national crisis emerged in December 1999, when Indian Airlines flight IC 814 from Kathmandu to New Delhi was hijacked by five terrorists and flown to Taliban-ruled Afghanistan. The hijackers made several demands including the release of certain terrorists like Maulana Masood Azhar from prison. Under extreme pressure from opposition parties and public for the safe release of the hostages, the government ultimately caved in. Jaswant Singh, the Minister for External Affairs at the time, flew with the terrorists to Afghanistan and exchanged them for the passengers. During his administration, Vajpayee introduced many domestic economic and infrastructural reforms, including encouraging the private sector and foreign investments, reducing governmental waste, encouraging research and development and privatisation of some government owned corporations. Vajpayee's pet projects were the National Highway Development Project and Pradhan Mantri Gram Sadak Yojana. In March 2000, Bill Clinton, the President of the United States, paid a state visit to India. His was the first state visit to India by a US President in 22 years. President Clinton's visit to India was hailed as a significant milestone in the relations between the two countries. Since the visit came barely two years after the Pokhran tests, and one year after the Kargil invasion and the subsequent coup in Pakistan, it was read to reflect a major shift in the post-Cold War U.S. foreign policy. The Indian Prime Minister and the U.S. President discussed strategic issues, but the major achievement was a significant expansion in trade and economic ties. The Historic Vision Document on the future course of relations between the two countries was signed by Prime Minister Vajpayee and President Clinton during the visit. Domestically, the BJP-led government was under constant pressure from its ideological mentor, the RSS, and the hard-line VHP to enact the Hindutva agenda. But owing to its dependence on coalition support, it was impossible for the BJP to push items like building the Ram Janmabhoomi Mandir in Ayodhya, repealing Article 370 which gave a special status to the state of Kashmir, or enacting a uniform civil code applicable to adherents of all religions. The BJP was however accused of saffronising (saffron being the color of the flag of the RSS, symbol of the Hindu nationalism movement) the official state education curriculum and apparatus. Also, Home Minister L.K. Advani and Human Resource Development Minister Murli Manohar Joshi were indicted in the 1992 Babri Mosque demolition case for inciting a mob of activists. The RSS also routinely criticised the government for free-market policies which introduced foreign goods and competition at the expense of 'swadeshi' industries and products. Vajpayee's administration earned the ire of many trade unions and government workers for its aggressive campaign to privatise government owned corporations. Vajpayee promoted pro-business, free market reforms to reinvigorate India's economic transformation and expansion that were started by the former PM Narasimha Rao but stalled after 1996 due to unstable governments and the 1997 Asian financial crisis. Increased competitiveness, extra funding and support for the information technology sector and high-tech industries, improvements in infrastructure, deregulation of trade, investments and corporate laws —- all increased foreign capital investment and set in motion an economic expansion. Atal Bihari Vajpayee with Russia's president Vladimir Putin. These couple of years of reform however were accompanied by infighting in the administration and confusion regarding the direction of government. Vajpayee's weakening health was also a subject of public interest, and he underwent a major knee-replacement surgery at the Breach Candy Hospital in Mumbai to relieve great pressure on his legs. On 13 December 2001, a group of masked, armed men with fake IDs stormed the Parliament building in Delhi. The terrorists managed to kill several security guards, but the building was sealed off swiftly and security forces cornered and killed the men, who were later proven to be Pakistan nationals. Coming just three months after the September 11 attacks upon the United States, this fresh escalation instantly enraged the nation. Although the Government of Pakistan officially condemned the attack, Indian intelligence reports pointed to a conspiracy rooted in Pakistan. Prime Minister Vajpayee ordered a mobilisation of India's military forces, and as many as 500,000 servicemen amassed along the international boundary bordering Punjab, Rajasthan, Gujarat and Kashmir. Pakistan responded with the same. Vicious terrorist attacks and an aggressive anti-terrorist campaign froze day-to-day life in Kashmir, and foreigners flocked out of both India and Pakistan, fearing a possible war and nuclear exchange. For as long as two years, both nations remained perilously close to a terrible war. But the biggest political disaster hit his government between December 2001 and March 2002: the VHP held the Government hostage in a major standoff in Ayodhya over the Ram Mandir. At the 10th anniversary of the destruction of the Babri mosque, the VHP wanted to perform a shila daan, or a ceremony laying the foundation stone of the cherished temple at the disputed site. Tens of thousands of VHP activists amassed and threatened to overrun the site and forcibly build the temple. A grave threat of not only communal violence, but an outright breakdown of law and order owing to the defiance of the government by a religious organisation hung over the nation.But to the relief of Vajpayee, his government was able to tide over this crisis rather smoothly. Later, Vajpayee made controversial remarks: "Wherever there are Muslims, they do not want to live in peace with others. Instead of living peacefully, they want to propagate their religion by creating terror in the minds of others." The remarks were perceived as a justification of violence against Muslimsand as "Muslim-bashing". The National Democratic Alliance (NDA) was widely expected to retain power after the 2004 general election. The 13th Lok Sabha had been dissolved before the completion of its term to capitalise on the perceived 'feel-good factor' and BJP's recent successes in the Assembly elections in Rajasthan, Madhya Pradesh and Chattisgarh. The BJP hoped to capitalise on the slogan "India Shining" and released many ads touting the economic growth of the nation. However, the coalition lost almost half its seats, with several prominent cabinet ministers being defeated. The Indian National Congress, led by Sonia Gandhi, became the single largest party and, along with many minor parties, formed the United Progressive Alliance. With the conditional support of the leftist parties from the outside, the UPA formed a government under Dr Manmohan Singh. Vajpayee resigned as Prime Minister and promised co-operation to the new government] Accepting moral responsibility for the defeat, he decided not to take up the position of the Leader of the Opposition and passed on the leadership mantle to Lal Krishna Advani. However, he retained his post as Chairman of the NDA. In December 2005, Vajpayee announced his retirement from active politics, declaring that he would not contest in the next general election. In a famous statement at the BJP's silver Jubilee rally at Mumbai's historic Shivaji Park, Vajpayee announced that "Henceforth, Lal Krishna Advani and Pramod Mahajan will be the Ram-Laxman (the two godly brothers much revered and worshipped by Hindus) of the BJP." Vajpayee was referred to as the Bhishma Pitamah of Indian Politics by Prime Minister Dr. Manmohan Singh during his speech in the Rajya Sabha. Vajpayee was hospitalised at AIIMS for chest infection and fever on 6 February 2009. He was put on ventilator support as his condition worsened but he eventually recuperated and was later discharged. Unable to participate in the campaign for the 2009 general election due to his poor health, he wrote a letter urging voters to back the BJP. His protege Lalji Tandon was able to retain the Lucknow seat even though the NDA suffered electoral reverses all over the country. The tall apolitical image of Vajpayee was said to be the main reason behind Lalji's success in Lucknow even though BJP's performance was poor elsewhere in Uttar Pradesh. 'Baapji' as called by his close friends and relatives has an adopted daughter, Namita. He is fond of Indian music and dance. He loves nature and one of his favourite retreats is Manali in Himachal Pradesh. Vajpayee has expressed very clear thoughts about his poetry: "My poetry is a declaration of war, not an exordium to defeat. It is not the defeated soldier's drumbeat of despair, but the fighting warrior's will to win. It is not the despirited voice of dejection but the stirring shout of victory."